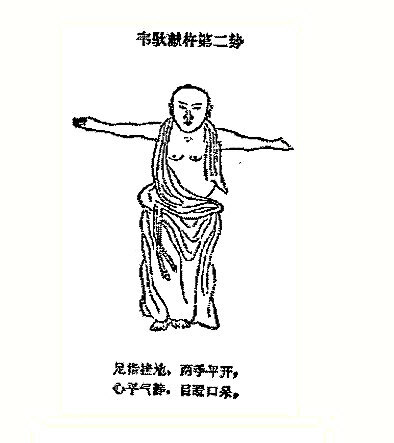 although shaoling temple has been claiming that yijinjing and shaolin kung fu were founded by bodhidharma, there are not enough historical and biblical evidences. 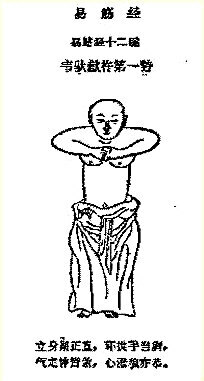 however yijinjing has been practiced so many years in shaolin and they’ve also been teaching so many people, most of all I think , whether of not bodhidharma made it, as a doctor and qigong practitioner that this is one of the best exercise for keeping fit and strengthening muscles and tendons, bodily structure as well that I’ve known. Here I introduce yijinjing from the wonders of qigong. Yijinjing literally means limbering-up exercise for the tendons. It is an ancient form of exercise in china, and is still used today by many people to keep fit and improve their physique. It is not only good for health building but also serves as a kind of therapeutic exercise for orthopedic traumatic patients during their convalescence. According to historical records, yijinjing was originally created and popularized as a means of strengthening the muscles and tendons. It is just as its name implies. Yi means limber up or strengthen. Jin means tendons and sinews. Jing means method. The exercise is designed to turn flaccid and frail sinews and tendons into strong and sturdy ones. Then movements of yijinjing are at once vigorous and gentle. Their performance calls for a unity of will and strength, i.e., using ones will to direct the exertion of muscular strength. It is coordinated with breathing. There are 10 forms in this set. The starting position of each form requires that the eyes look straight ahead, the teeth are gritted tight together, the mouth is slightly open or closed but not tight, and the tongue rests on the hard palate. Do not exert force, do not throw out the chest or raise the shoulders, and do not bend. Breathe naturally, keep relaxed, direct attention to the navel, and swallow the saliva when necessary. Be sure that each of these points is carried out throughout the exercise. These requirements will not be repeated when each of these forms is dealt with in detail below. 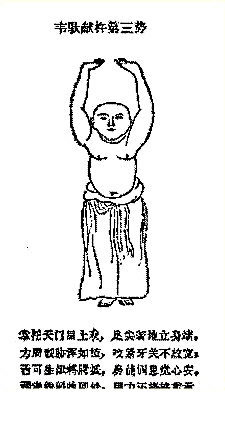 The main feature of this exercise is that all the movements are executed with the palms. At the beginning, each movement can be repeated eight or nine times. After a period of training, the number may be gradually increased to 30 times or more according to ones physical condition. Below the old figures of yijinjing.